Blogs as well as Facebook provide a platform for airing views, whether it be what I classify as political BS, or how bad Starbucks Coffee happens to be etc. This is a very rare rant for me but currently I am highly brassed off and it has NOTHING to do with photography. It is all to do with VALUE in the entertainment industry. Over recent years there has been numerous posts on websites and social media by musicians who quite rightly complain about establishments and venues who are not prepared to pay reasonable fees for performances. Yes it is extremely hard for musicians to get gigs now and get paid for what they are worth. I do my best to help, providing artists with high quality images at NO cost, to do with whatever they wish. People who LISTEN to music like myself are always prepared to pay to see people we like and respect. We are blessed in New Zealand at the value we can normally find to see wonderful performers. As an example, in 2018 Twenty dollars to see the great Roy Phillips (ex Peddlers). Five dollars (members) and fifteen dollars public to see Ray Woolf sing his heart out at Auckland Jazz and Blues club. Plus many others PLUS those who perform free. 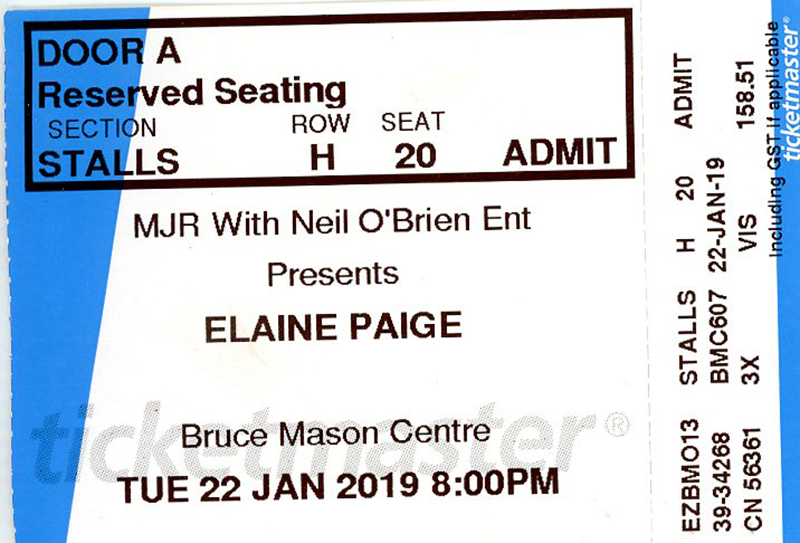 WELL, last night 22nd January four of us paid Six hundred and thirty four dollars and four cents to see Elaine Page at Bruce Mason Theatre in Takapuna. We did not know Elaine Page was performing there. We found out an hour earlier while at a restaurant nearby. Wow, we could not believe it, off to get the very best tickets we could, if there happened to be any left. It was beyond belief that someone like me did not know this world class performer was here in Auckland. I had been lucky enough to see her perform in London many years ago. The excitement was bubbling and we could not believe our luck to find out last minute and get what were without doubt, the best seats in the house. The opening act was a set performed by the “John G Smith” Band, the backing group for Elaine Paige. They were spectacular, wonderful musicians and YES they used real instruments. The opening number one of my favorites “Mountain Dance” written by the great Dave Grusin. No complaints at all, thirty minutes of great music by a superb group, in a nice theatre and at that stage a good atmosphere. THE SECOND HALF OF THE SHOW WAS PERFORMED WITH THE AUDITORIUM LIGHTS ON. There was virtually no dimming of lights after half time yet the first half was performed in darkness with a well lit stage. There was a row of spots along the ceiling directly above our seats which were too bright and reflected off our eye-wear making it difficult to see the stage which we could do in the first half. There were many grumpy people including our friends who felt they had paid good money to be let down by a dumb decision to keep the lights on over the audience. The sad thing is Elaine Paige would have had a full view of the many empty rows of seats. This show was badly promoted (if at all). For artists of this calibre and a woman who has led such a spectacular career over many years deserves an audience of more than just a few hundred people. Despite me laying a complaint with the management on behalf of our friends and others around us nothing was done about the lights. In addition despite the most professional performance by a world acclaimed artist many people were expressing their dissatisfaction at the ned of the concert over the bad lighting. In my opinion if there happened to be a request by the performer to leave the lights on (which is what I was told by management), was a bad decision. All of a sudden the VALUE of our seats were diminished, it was not the same experience as the first half which was performed with the auditorium being in full darkness and a nicely lit stage. There was no photography permitted which is OK, however at least I am able to show a copy of the ticket I paid for a great performance but disappointing experience. After having had first hand experience promoting and marketing in my own career it requires work these days to please people, entertainers are meant to have people leave feeling happy. Oh well I will just lay it on an promoters who I was were not even present, just a bunch of monkeys.